The inability of the Syrian government to crush an 18-month-old revolutionary movement is putting increasing pressure on its neighbors. Not only have hundreds of thousands of refugees from Syria poured into Jordan, Turkey, Lebanon and Iraq, but political forces in each of those countries are having to choose sides and to reevaluate their choices over time. In Saudi Arabia on Sunday, hundreds of Syrian pilgrims in Mecca staged a protest against the Damascus government. They were quickly dispersed by Saudi security forces, who do not permit political manifestations during the Hajj on pilgrimage. The bombing in Beirut’s Ashrafieh neighborhood that killed security chief Wissam al-Hassan last week has widely been blamed inside Lebanon on the Shiite Hizbullah party-militia, which backs the current government of Najib al-Miqati. Angry Lebanese Sunnis of the March 14 movement led by Saad al-Hariri, who oppose the government of Bashar al-Assad in Syria and sympathize with their Sunni co-religionists in the Syrian opposition, have vowed to bring down the Miqati government. Miqati said Sunday that although he had thought about resigning, he has decided not to stand down. Still, it remains to be seen if the Lebanese government can avoid falling, given the firestorm set off by the Syria conflict. The problem for Miqati and Hizbullah is that among their key coalition partners is Walid Jumblatt, the mercurial Druze leader, who is said to be turning against the Baath government of Syria. (Jumblatt has flip-flopped on Baathist Syria several times; it is alleged that Bashar al-Assad’s father, Hafez al-Assad, had Walid’s father, Kamal Jumblatt, assassinated in 1977.) The Washington Post is even hinting that Hizbullah’s Hassan Nasrullah is himself wavering on whether to continue to support Syria so strongly, given the possibility that it could mean the loss of the Miqati government and the political marginalization of Hizbullah inside Lebanon. I actually doubt that Hizbullah is wavering, given its strong alliance with Iran, which is backing al-Assad. On Saturday, Sunni guerrillas unleashed a series of bombings and attacks on Shiite pilgrims and Shiite neighborhoods in Iraq. Although this tactic of attempting to foment Sunni-Shiite violence is by now 9 years old, it may be continuing in force in part because of the new struggle over the future of Syria. Syria’s Baath government is secular, socialist and nationalist, but the upper echelons of the Baath government and army are dominated by members of the Alawite minority, a form of folk Shiism. About 10-14 percent of Syrians are Alawite. The al-Assad government also has a geopolitical alliance with Shiite Iran and, increasingly, the Shiite government of Iraq. The idea of a 4-day cease-fire in Syria’s ongoing revolution/ civil war during the Eid al-Adha (Feast of Sacrifice, commemorating Abraham’s willingness to sacrifice his son for God) was always a difficult proposition. 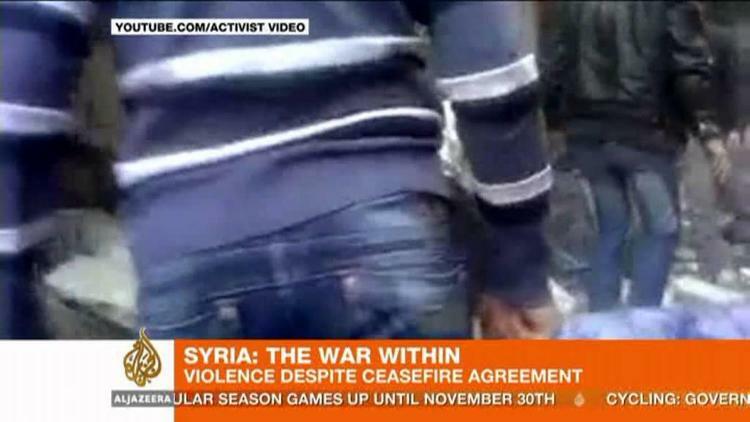 Cease-fires work when two sides are exhausted and can’t see how easily to make further gains through fighting. That situation does not obtain in Syria– the ceaseless back-and-forth of guerrilla strikes and regime reprisal has been going on for over a year, and the revolutionaries appear to have gradually chipped away at the Baath government’s control of much of the country. When one side has the momentum, it simply makes no sense to have a cease-fire. On Friday, the very first day of the attempted cease-fire, a massive truck bomb shook the capital, blamed on a radical fundamentalist group that has, however, denied involvement. The regime accuses the revolutionaries of using it as a cover to try to take more territory, while the rebels accuse the regime of launching aerial bombings and artillery barrages designed to roll back their positions in Homs and the Damascus suburbs. As the Syrian revolution continues to unfold, it is likely to reshape not only Syrian politics but also those of its neighbors.